Nearly one in four traditional grocery stores won’t be around in five years, according to the Future of Food Report released Monday by Inmar. 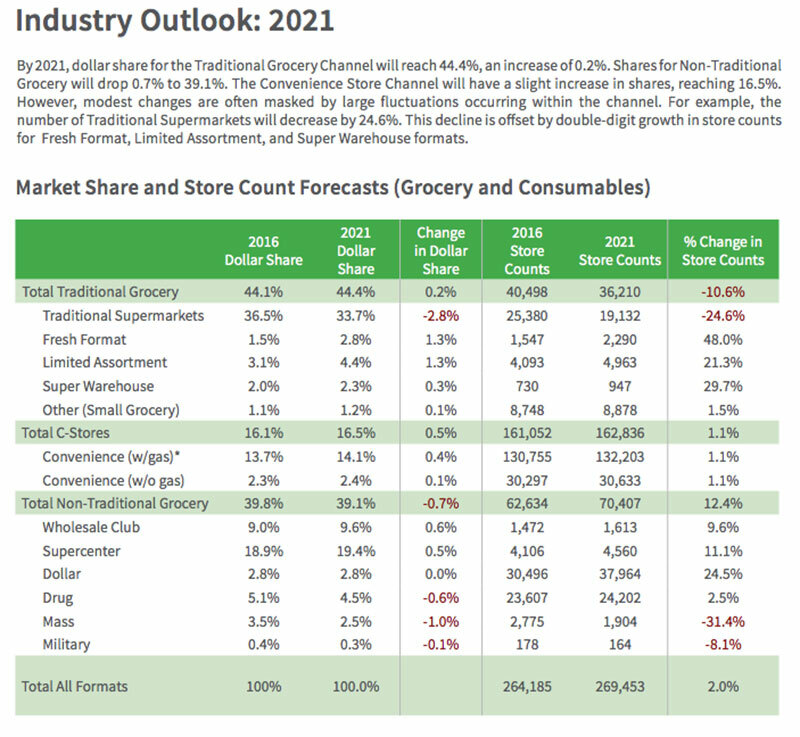 Dollar share for traditional supermarkets will also continue to decline though 2021, Inmar projected, while most other formats including fresh stores, limited assortment stores and “super warehouse” stores will gain share and store count in the years ahead. Food e-commerce will also grow at a rapid pace, the report said. Inmar defines “traditional supermarkets” as those with at least $2 million in annual sales and up to 15% of their sales in general merchandise and health and beauty. That channel is already in rapid decline, Inmar said, losing 2 points of dollar share and 5.9% of its sales in 2016 as compared to 2015. Inmar projected sales in this channel would not keep pace with projected 2.2% annual food inflation as consumers spread sales across multiple channels and formats. Traditional supermarkets in 2016 accounted for about $440 billion in sales and are still the largest seller by format of food and consumables, Inmar noted. Inmar estimates the total market for food and consumables exceeds $1.2 trillion annually. E-commerce food sales will more than double by 2021, growing from around $33 billion, or 4% of the $795 billion food and beverage market in 2016 to $70 billion or 8% of the market. Among “traditional” trade channels, Inmar said limited assortment stores like Aldi, Trader Joe’s and Save-A-Lot will grow by more than 21% or nearly 1,000 stores over the next five years, growing dollar share from around 3.1% today to 4.4%. Fresh format stores — including natural and organic stores and specialty formats with differentiated center store assortments from traditional retailers like Mariano’s. The Fresh Market and Byerly’s will grow by 48% in store count by 2021. Both Fresh and limited assortment stores will grow dollar share by 1.3% by 2021, making those formats the fastest growing of those identified by Inmar. “Super warehouse” stores like Cub Foods, Food 4 Less and Smart & Final, will also grow by nearly 30% in store count by 2021, taking dollar share of the total market from 2% to 2.3%. Inmar also predicted that wholesale clubs and supercenters would gain store counts and share by 2021, while nontraditional competitors like drugstores, mass merchants and military commissaries will see shares decline.